New Orleans has always been fashionable! Most visitors love the colonial-style shotgun houses with cast iron accents, but New Orleans has also always been one of the most architecturally progressive cities in the nation. In 1955, more modern style buildings in New Orleans and Louisiana were recognized by Progressive Architecture than any other US city or state. It’s easy to overlook the examples of modern architecture that help make the city so attractive. The mid-century modern style made an indelible mark on the city. Some of these buildings take their inspiration from the classic styles, and others stand out starkly from the European influenced Caribbean look that defines the rest of the city. The Tulane School of Architecture has influenced the education and preservation of public knowledge about the unique homes in the area. While many of the nearby traditional homes were sold quickly, the uniquely modern homes built during the middle 20th century have been preserved and cataloged by the school. They’ve even developed a GPS enabled app called New Orleans Regional Modernism which can help you identify the homes in the Lakeview, Lake Vista, and Park Island areas. Exploring the houses in those areas is best done by car because they’re sprinkled throughout the neighborhoods, not clustered close together. When the topic of modern architecture in New Orleans comes up, the most common building discussed is the Superdome. Designed by the hometown firm Curtis and Davis, the building opened as the Louisiana Superdome in 1975. To this day, it is the largest fixed domed structure in the world, covering 13 acres with a diameter of 680 feet. Another fine example of modern design in New Orleans is the National World War II Museum, designed by Voorsanger Architects. The irregular geometrical shapes of metal and glass contrast with the cast concrete structure for an intriguing take on modern. In 2005, Hurricane Katrina hit New Orleans, destroying significant modern architectural landmarks and damaging others beyond repair. These once award-winning scions of style are no longer a part of the progressive architecture scene. The St. Frances Cabrini Church was demolished in 2007 after suffering extensive flood damage in the hurricane. 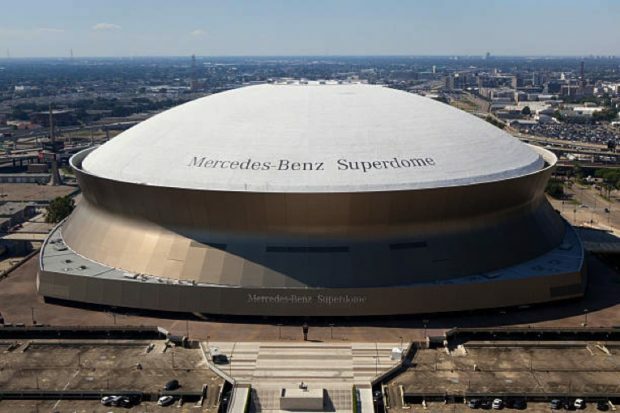 Having once won a national award from the American Institute of Architects, the 1963 structure was designed by the same firm as the Superdome, the local firm Curtis and Davis. One of the most opulent examples of modern construction is the Olivetti Building. Designed by local architect Charles Colbert, the structure was the flagship showroom of the Olivetti Typewriter Company. It was razed as part of the Lower Mid-City demolition in 2008. One of the biggest losses culturally and historically was The International Longshoremen Association Building. The building was home to many pivotal Civil Rights Movement meetings after its construction in 1959 by Lawrence and Saunders. Hurricane Katrina destroyed it beyond repair. When people think of New Orleans, they usually picture the mashup of European and Caribbean styles. But the Big Easy took inspiration from all kinds of artists, so it’s not a surprise that modern architecture left a signature during the mid-Twentieth Century.